Aims offers the Dymetec plastic strap system, an excellent alternative to the heavy duty Smart Band for applications where space is restricted and lesser tensile strength is admissible. 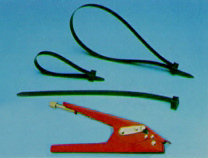 Dymetec tie straps are based on a unique polymer orientation technology, developed by DuPont engineers, and are available in nylon as well as outdoor weatherable acetal. Unique proprietary technology has made it possible to create an entirely new kind of tie system for a broad range of bundling and fastening applications. Available in any length up to 30 feet or more! The Dymetec®-N system is ideally suited for more demanding applications in the automotive, truck/trailer, packaging, palletizing, construction, HVAC*, and other industries. Dymetec®-N, based on 6/6 nylon, is lighter, more flexible, and easier to handle than conventional metal or plastic ties of equal strength. In addition, the unique orientation process imparts excellent creep resistance over a wide temperature range compared to conventional plastic ties. Also available in handy 100' or 200' rolls of tie strap and bags of heads for unique versatility and quick application. 400 lbs. (180 kg) loop tensile strength! 2-piece system allows for virtually any length up to 30 feet or more. Tie strap available in 100' or 200' rolls with separate heads. Three to four times stronger than conventional nylon ties of equal cross section. Easier and safer to install. Uses unique stainless steel pawl to grip the strap. Textured sides for improved handling. Used to "snug up" strap in head and cut strap in single step. Amount of tension (snugness) can be varied. Dymetec®-A is lighter and easier to handle than conventional plastic or stainless steel strapping systems...yet it is stronger, more durable and exceptionally resistant to the most extreme weather conditions. Available in any length up to 30 feet or more! Also available in handy 100' or 200' rolls of tie strap and bags of heads for unique versatility and quick applications. Oriented strap achieves higher tensile strength than unoriented polymeric alternatives. Excellent UV, moisture and chemical resistance. Continuous operating temperature range from -40° to 185° F.
Minimum 20-year outdoor life expectancy.